A Gursikh, quite simple, is a Sikh man or woman who has completely surrendered their body, mind and soul to The True Guru, Waheguru. The Gursikh lives their life remembering Waheguru with each breath and abide by the teachings of Guru Nanak Dev Jee. The Gursikh is a humanitarian - one who loves, serves and cares for all of mankind and sees all as equal. A Gursikh is one who has taken Amrit and offered their head to the Guru, but it takes much more than taking Amrit to live the life of a true Gursikh. Read below just a few examples of some of the greatest Gursikhs to have ever graced this Earth. Bhai Harjnder Singh Jinda and Bhai Sukhdev Singh Sukha are two martyrs in the 20th century history. Sukhdev Singh and Harjinder Singh stood for the truth and accepted the sikh historical traidition of acting against enemies of the Sikh nation. They repeated history and proved that the sikh spirit of the past is alive and well in the present. They are part of the new chapter of ongoing sikh history. Bhai Amrik Singh (1948 – June 6 1984) was the President of the Sikh Students Federation after being elected into the position on July 2 1977 and remained president until his death on June 6 1984. He had passed his Masters in Punjabi from Khalsa College in Amritsar. After this he began research work on his Ph.D. thesis. He was the son of Sant Giani Kartar Singh Ji Khalsa Bhindranwale the 13th leader of the Damdami Taksal which meant he was well versed in Gurbani and Sikh literature. 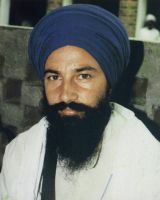 Bhai Mani Singh was born at a village named Kailbowal. The village was later destroyed during Nadar Shah's invasion. Its ruins are near Sunam district Patiala. His father was a Jat Sikh named Chaudri Kala. His parents called him Mania. When he was about five years of age his parents visited Anadpur. They did so to see and pay homage to Guru Tegh Bahadur. Guru Gobind Singh then known as Gobind Rai was about the same age as Mania. They became playmates and friends. In recent times the Indian authorities have been trying to eliminate not only the Sikh people but also those belonging to other minorities in India by persecution and genocide. Sant Jarnail Singh Khalsa Bhindranwale awakened a sleeping nation and invited the Sikhs to raise their voices against the tyrant rulers. In this struggle to defend the Sikh nation thousands of brave Sikhs have received martyrdom and one of these is Baba Gurbachan Singh Manochahal who was one of the greatest leaders of the present struggle.